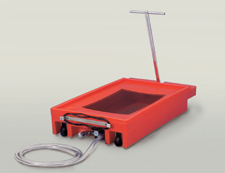 Todd's Oil Drains are the safest and easiest way to drain waste oil or hydraulic fluid. Unique wide-bodied design eliminates tipping and assures proper balance. 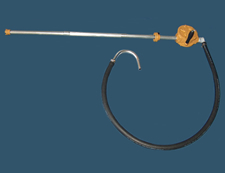 Constructed of rugged, heavy duty polyethylene for strength and durability, Todd's Oil Lift Drains will resist rust, dents, automotive fluids and other chemicals. 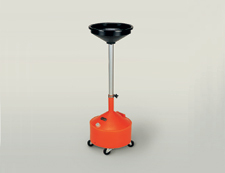 Standard features include: a stainless steel damp to secure 2" non-corrosive telescope tube and an 18" funnel made out of rugged black polyethylene. Shipped one per box and are UPS-able. Height adjusts from 48" to 67"
Height adjusts from 48" to 71"
Todd Low-Boy Oil Drain rolls under trucks or buses to drain oil or antifreeze with ease. 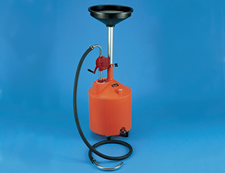 Todd's Low-Boy Oil Drain is constructed of heavy-duty polyethylene that will resist rust, dents, automotive fluids and other chemicals. 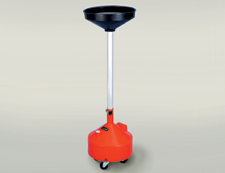 The polyethylene body is translucent for easy viewing of the fluid level and it rolls easily on 4 lubricated casters that are recessed into the body of the oil drain for ease of movement and protection from damage. 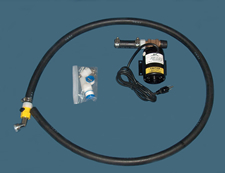 The gravity drain valve is recessed to protect it from damage and a wire screen in the pan prevents foreign matter from entering into the reservoir.Shown with optional 115v Evacuation Kit. 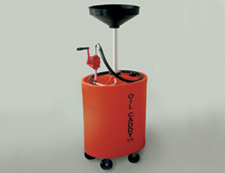 To order the Low-Boy Oil Drain with a 115v Evacuation Kit included, use Product Number: 2400-37. Height adjusts from 55" to 78"